The Maritime Exchange is pleased to announce the nomination period for its 2019 Unsung Hero Award opened on January 15. The program honors those who toil behind the scenes day in and day out to facilitate ships, cargos, and crews — but whose efforts go largely unrecognized. Last year’s inaugural award was a tremendous success! The recipient, Eric Clarke of Philadelphia Energy Solutions, could not have been more appreciative, and Exchange members turned out in full force to support him. Like last year, the presentation ceremony will take place at a Maritime Exchange membership mixer, to be held this year on May 8. The Unsung Hero Award is designed to allow Exchange members to shine a well-deserved spotlight on someone in the shadows who is making a marked contribution to our port and its business community. This is your opportunity to acknowledge individuals who work hard behind the scenes to make our port more competitive, safe, secure, and environmentally healthy. Those who proposed candidates not selected last year are encouraged to try again. The 2018 program saw several extremely worthy nominations, and we hope to receive the same caliber of entries again this year! Who is eligible? Any employee or volunteer within any Maritime Exchange member company is eligible for nomination, except as noted below. Check here if you’re unsure whether your proposed candidate is affiliated with a member company. Individual has served his/her organization with extraordinary dedication and distinction over a period of time. Winners of previous port awards (for example, Seafarer’s Friend, Spirit of the Port, Friend of Chile, Maritime Society or World Trade Association “people of the year”) are NOT eligible for the Unsung Hero Award. Who may submit nominations? Primary representatives of Exchange corporate member companies are welcome to submit nominations. Each member company is entitled to submit one nomination per award cycle. If you don’t know the primary representative for your company, you can look it up here. How to Participate. Sponsors must download and complete a one-page nomination form and email the completed form to hero@maritimedelriv.com by February 15, 2019. No other form of entry is acceptable, and entries submitted on any others forms will be disqualified. The Award. In addition to the membership event, the sponsor, recipient, and his or her guest(s) will join the Maritime Exchange board of directors for a luncheon at Spasso Italian Grill. This year’s hero will also be profiled in the Exchange newsletter, The Beacon. Contact. Members with questions or who are unable to download the form or send it back via email should contact Beverly Ford at 267-670-7946 or bford@maritimedelriv.com. The Maritime Exchange looks forward to joining its members in this celebration of Delaware River port community unsung heros! 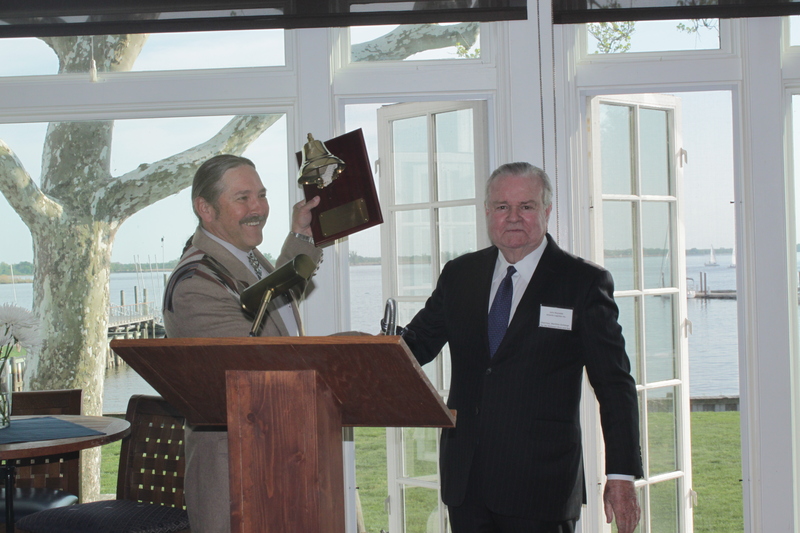 Eric Clarke (left) accepted the first Unsung Hero Award from Maritime Exchange Chairman John Reynolds. Even after nearly 40 years in the industry, Eric Clarke is still bursting with enthusiasm about his work and about the many people he calls friends and colleagues in the port industry, locally and throughout the world. As the recipient of the first Maritime Exchange Unsung Hero Award, Clarke exemplifies the very qualities the award seeks to acknowledge: not only has he served his organization — and the Delaware River maritime industry — with exemplary distinction and dedication, he is also responsible for developing a new process for oil vapor recovery that resulted in cleaner air and a safer working environment.